I’m enjoying knitting this shawl. It’s grown a lot since you last saw it. Yes, there are over 275 stitches and growing that I have to purl back, but you know what, it’s not a big deal. I guess I’m maturing as a knitter. I don’t even mind that I have to count the plain rows between lace patterns anymore. Look, I even actually use a row counter now! Whoddathunk? This is my Seraphim Shawl and I am mid-way through the first chart, still on the first skein of my own hand-dyed yarn. You can find more details of the yarn here in my Etsy shop, where incidentally shipping cost has been removed on all orders. Forever. Ahem. Back to the knitting. Yes, I love working on this shawl, it’s my TV knitting, it’s my car project and it’s even my lunch break project. 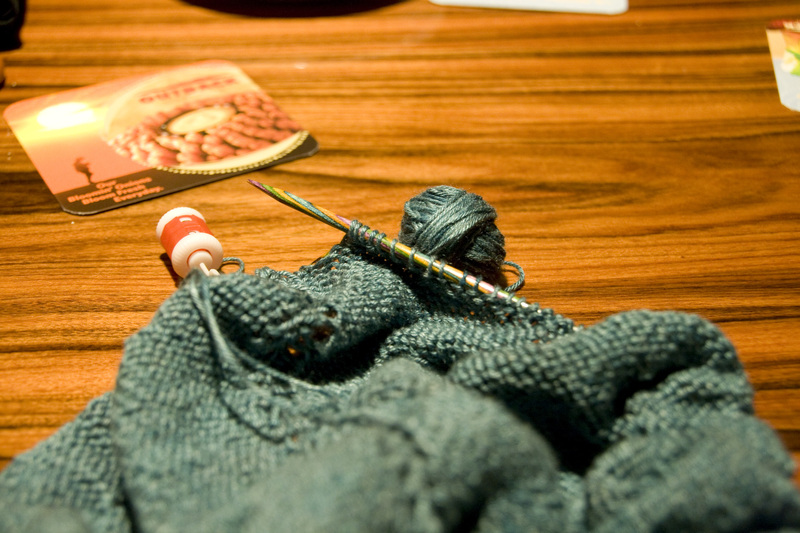 I’ll work on it all week next week, because on Friday I am starting a Koolhaas mini-KAL with Brenda in Ravelry. Wish me luck! That is such a beautiful colorway! I find stockinette soothing too! !